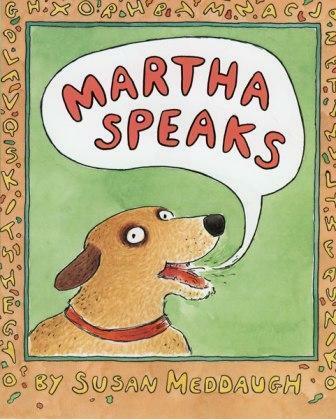 After devouring a bowl of alphabet soup, Martha dog is endowed with the power of speech and does all of the above. Her family is enthralled and amused by this newfound talent at first, but Martha soon overwhelms her family with secret phone orders for BBQ and nonstop chitchat. (Martha is not a veggie dog, but had her family talked to her about factory farming, I’m sure she would’ve opted for V-Dog instead.) After being yelled at to “shut up,” Martha recoils into isolation and sadness. But all ends well at the conclusion of the tale when Martha pulls off a Walter the Farting Dog-like feat of bravery and heroism. Sincere, comical and insightful, Martha Speaks helps kids decipher the fine line between saying just enough and too much. Also a great read for highlighting and appreciating animal sentience and intelligence. There is now a PBS TV show (check out the website for interactive activities) based on the Martha Speaks book series. This is a great character! We haven’t read this book but have enjoyed others by the same author. My children love the t.v. show, and since we homeschool, they watch it every lunch hour. Thanks for highlighting it. My kiddo likes the book Martha and Skits. Skits can’t talk like Martha, but he’s part of the family all the same.